Thankfully, the majority of the cats that come into our care very quickly find themselves loving forever homes. However for various reasons, some cats are with us for a longer stay. Some are not quite the right age, not the right colour, not the right temperament or just plain unlucky. We like to give these challenging-to-rehome cats a little bit of help by giving them a special place on our website, letting you know a bit more about what we think makes them special and what their ideal new home should offer. Our current featured cat is Smudgie. 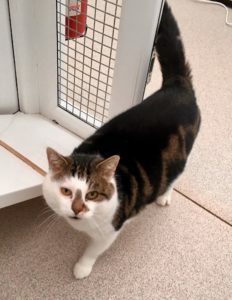 Smudgie is big, chatty and playful six-year-old lad who purrs like a train, and dearly wants someone to give him strokes. However Smudgie comes with a “be careful” warning! 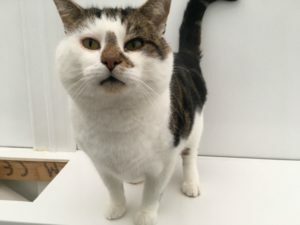 This handsome tabby and white chap with a “smudge” on his nose, arrived with us in Summer 2018 as an unneutered stray. It is suspected that his previous people abandoned him. He was grumpy on arrival and was quick with the claws and teeth. We put this down to the change in environment and the fact he was no doubt in discomfort due to a huge abscess on his leg which required treatment. Smudgie has now calmed significantly, 90% of the time. However he remains one of the most predictably unpredictable cats we have had staying with us in recent years. He will rub against your legs, he will purr and make eyes at you, but when you stroke him it is almost always just a matter of time before he launches himself at you. Sadly there can be real intent in these onslaughts. If you think you could give Smudgie the forever home he so deserves please contact our shelter.